Bring a taste of Asia to your kitchen with this Thai chicken recipe. 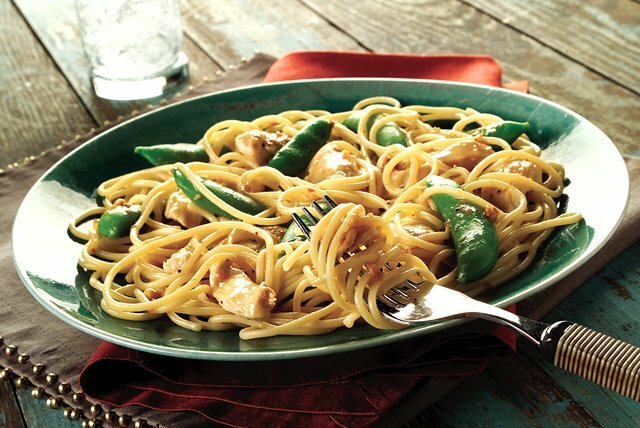 The sugar snap peas complement the peanut sauce while adding color and crunch. Pour 1/4 cup dressing over chicken in medium bowl; mix lightly. Refrigerate 1 hour to marinate. Meanwhile, whisk remaining dressing with peanut butter, honey, soy sauce and crushed pepper until blended. Reserve for later use. Cook spaghetti as directed on package, omitting salt. While spaghetti is cooking, remove chicken from marinade; discard marinade. Cook and stir chicken in large nonstick skillet on medium heat 5 min. or until chicken is no longer pink. Add peas; cook and stir 3 min. or until chicken is done. Remove skillet from heat. Drain spaghetti. Add to chicken mixture along with the reserved dressing mixture; mix lightly. Cutting boneless skinless chicken breasts can be a slippery task. Make it safer and prevent the knife from slipping by cutting the chicken while it is partially frozen. The firmer chicken is much easier to cut and handle. Refrigerate any leftovers. Serve cold as part of your lunch the next day.